I love spring because it means asparagus growing season. Asparagus is my favorite vegetable. I love it simply steamed with a squeeze of fresh lemon juice, chopped in a stir fry or sauteed in butter. I could go on, but suffice it to say I love asparagus just about any way you cook it. When buying asparagus look at the tips of each spear. They should be tightly closed, and not look dry or frayed. If you are not using it immediately, place the asparagus stem side down into a container with a little water, almost like when you put flowers into a vase. 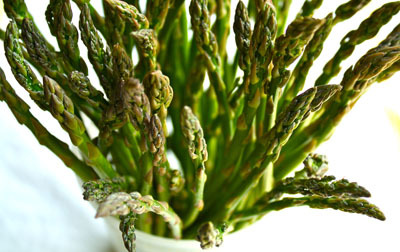 The asparagus will “drink” the water, and stay fresher. Roasting asparagus is a very easy way to cook it, and brings out the sweetness of the vegetable. Roasting allows you to vary the flavors you use, such as using an infused oil, adding fresh herbs or a particular spice you enjoy. This recipe uses basic flavors of olive oil and balsamic vinegar. I shouldn’t really call this a recipe because it is so simple. Heat the oven to 400 degress F. Place the asparagus on a baking sheet. Drizzle the oil and vinegar over the asparagus, then sprinkle with salt and pepper. 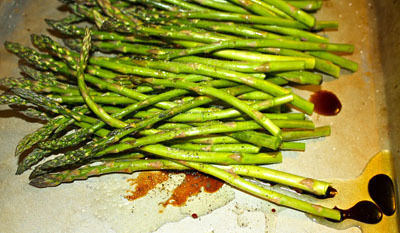 Toss the asparagus to coat evenly, then place in the oven for 8-10 minutes, depending on the thickness of the asparagus. 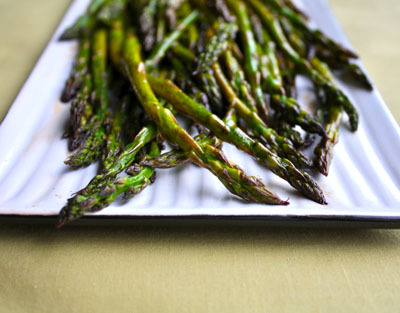 You want to roast just until the asparagus is tender and slightly caramelized. If you would like you can shave a hard, aged cheese, such as Parmesan or Manchego over the asparagus. This dish can be served hot or at room temperature, as a side dish or added to a salad or pasta. You can also do what I usually do, which is to stand in the kitchen eating the spears of asparagus with my fingers straight off the pan. Tried asparagus tonight and enjoyed it!! Thanks for the tip. Asparagus is one of my favorite things with spring. Delicious! I just started an online cooking show, please check it out! 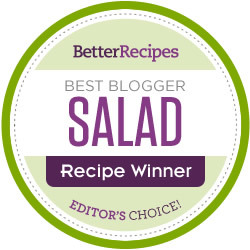 wow….i luv that…but never thought 2 try it with balsamic vinegar….u r making me hungry..LOL! Love fresh asparagus and how you cooked this. 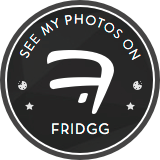 Gorgeous photos too. I have been coooking asparagus this way for a very long time. EVERYONE loves it!! 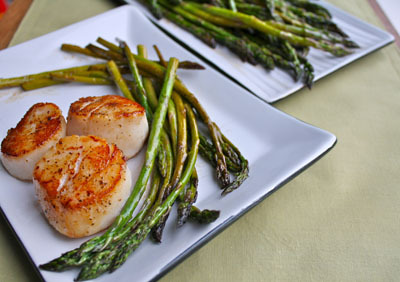 I love grilled asparagus and what a great pairing with the scallops!